After Gay released this little guy, she released a 56 pounder into the cooler. From one of the hardest working fishermen that I've ever been around. "Sent my info to the guy you sent me. this morningThanks abunch CoCo ole Buddy......and by the way.....don't be sore lipping my little brown buddys.....they are already hard enough to catch by the time they get here" -----Capt. Rick Caton. If you are ever in Hatteras and you want to get on the water, Capt. Rick or his son Patrick are the men up there. 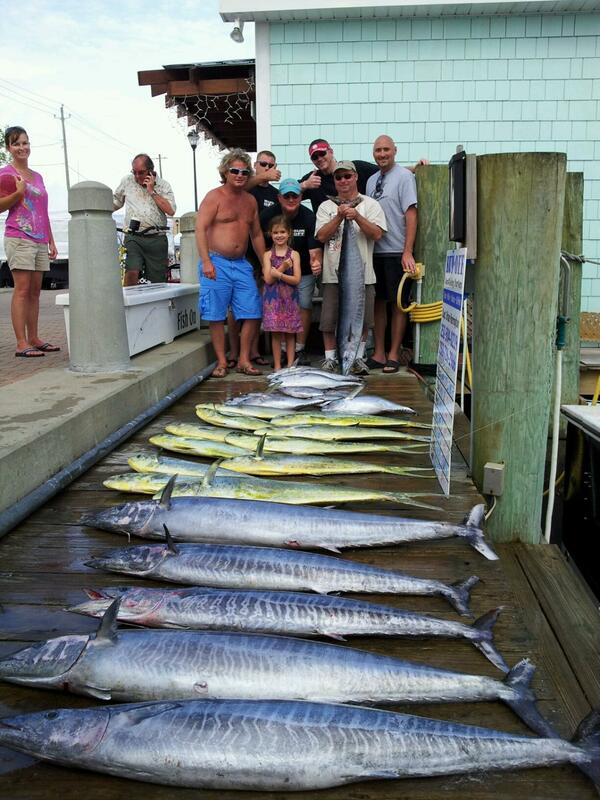 Every once in a while we get a call from someone fishing the northern Outer Banks, NC. It's good to know that some good "Down East Guides" are fishing up there. 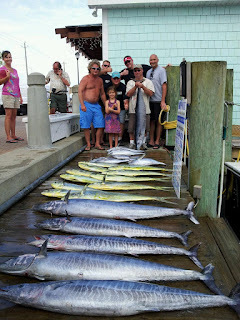 Here’s a pic of our catch this morning out of the Manteo waterfront. The spec fishing is silly good. I hope it holds for a while. Seems to be a ton of fish scattered all over the sound along with a huge cobia push as far as Oregon Inlet today. Lots going on up the beach. Hope all is well. Capt. 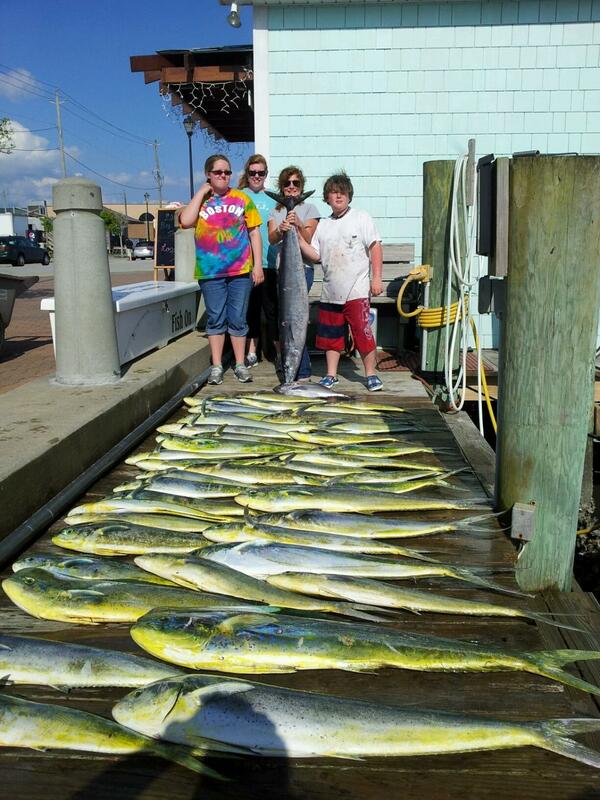 Justin Haddock is pretty good in the blue water also, this is his dolphin catch and report. 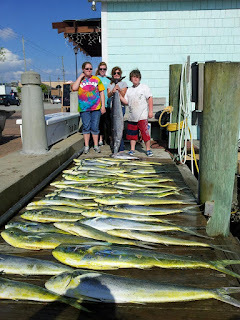 Went offshore Tuesday caught a few dolphin. When I came in the boat kept wanting to drift towards the color change outside the inlet. Three cobia greeted me as i arrived all shorts. Couple hundred yards and there were three more, one was nice, shot him the bucktail but he would have nothing to do with it. Wasn't really prepared for cobia, but found out that he wouldn't eat ballyhoo either. With a box full of mahi to clean decided it was time to head in. saw eight fish all together in about 30 min. as i hit the inlet i was thinking darn maybe i should have stayed in and cobia fished. 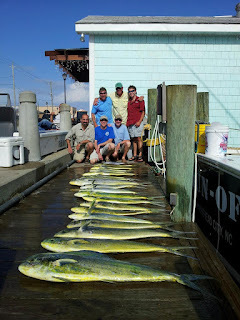 I wanted a 50 pounder bad to go in the box with the mahi. From the radio talk offshore sounded like Brian was sending smoke signals. When it all cleared he caught 4 blues. Been busy, but would love to ride along with you again and look for some more cobes. You betcha. They're great eating and they are a great fight.....when caught on trout rods and yozuri plugs, throw in a few Atlantic bonito and you've got sushi appetizers, add a couple cobia that you run accross in your travels and all of the sudden, you've got a great half or 3/4 day of fishing......not to mention that the aj's that are within 3 miles of the beach, even a gaffer dolphin came out of the Dead Tree Hole yesterday afternoon. Very good stuff, it's like Marine Land out there, the water is so clear that you can see a cobia on the bottom in 25 feet of water......although the tower does help. You just missed it. They showed up big today. Chris and Greg combined caught over 40 cobia. Chris caught 13 out of one bait ball. I came on the scene from catching amberjacks and saw 50 cobia in less than 2 hours. I had some fly guys and I nearly pulled my hair out watching cobia eat their fly and then spit their fly out. It was extraordinarily painful. At one time I saw 15 fish on the surface around a bait ball, including a 66 pounder that I hooked on a bucktail after it was missed by the fly angler. I mean it was really incredible………we killed 3, they never caught one on a fly, the other two I hooked from the tower as we were running home. 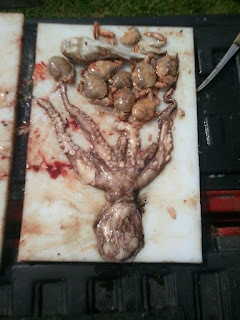 ----This is how I described the big bite that fired off 10 days ago......... and has moved on up the beach. 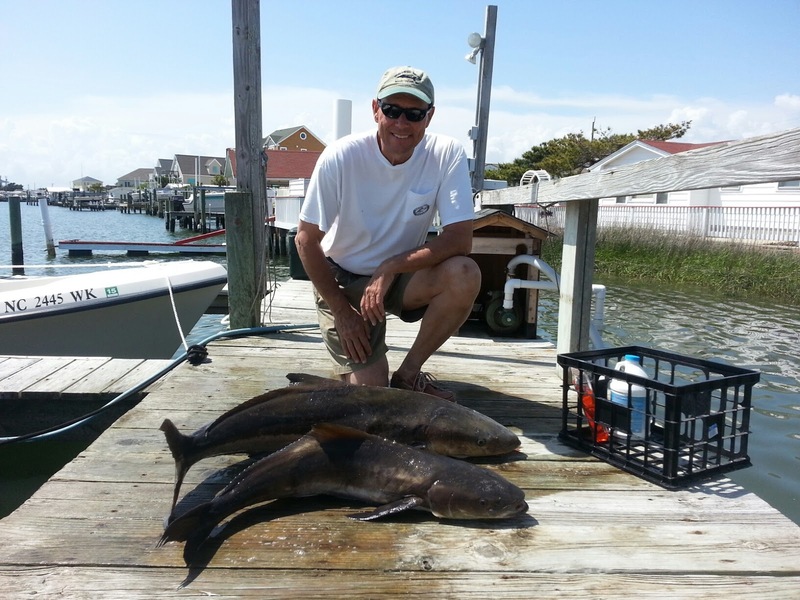 There are still plenty of cobia around, but nothing like what came by us over the past 10 days. 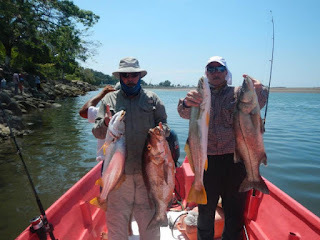 Also a load of light tackle spanish and amberjacks that are within range of a half day, the sea bass are going to get theirs when the season opens June 1. I know, I know, there are a lot of great MHC/Atlantic Beach offshore charter boats and I keep posting pictures of the Run Off.....well, Capt. Brian and Marty keep having fantastic catches and they keep sending me pics. I don't post them all, but this one is pretty noteworthy. 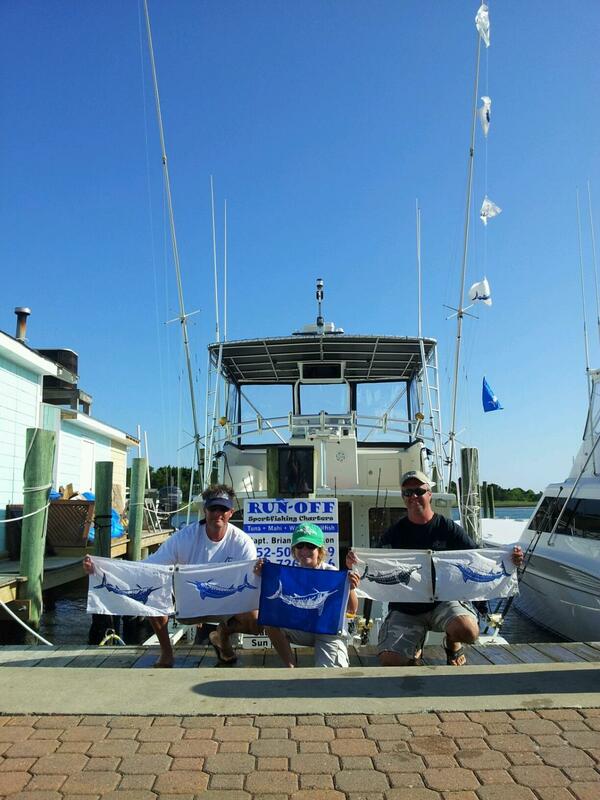 That's right, 4 blue marlin releases and a white marlin out of MHC. Including a 600+ blue marlin. Capt. 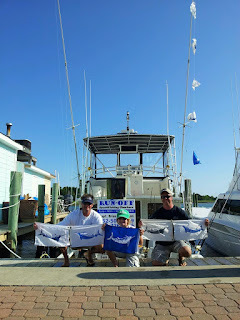 Pete Zook on the Energizer caught a pair of blue marlin himself and got a picture of Brian's big blue.......with the Big Rock Tourney two weeks away, I hope the bite holds. Whether its bluewater fishing to fill the box or you are looking for a blue marlin in North Carolina or Costa Rica, let Down East Guide Service find the right boat for you. Not only are they fun to catch on light tackle and jigging spoons, but they are also really, really good eating and you don't have to go far to get 'em. Limit is 5 per person. In addition to the bass there is a really good chance of also limiting out on gag grouper, running into a cobia or 2 or 10 and all the maximum pulledge that you want with amberjacks. This nearshore mixed bag will remain really good well into July and the Down East Guides focusing on this fishery still have a few openings. Nope, not a Largemouth Bass. The Run Off does it again with a nice catch, a really nice tuna and a pair of billfish. Got a couple nice 'uns today. He just got off the tug and is already laying it on us with a pair of 60 pounders. Thanks for a fantastic day of cobia fishing. 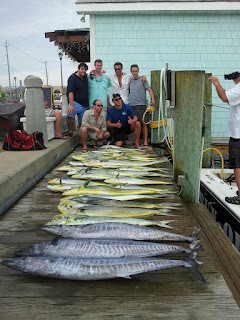 Two 50+ pound fish in one day and a third fish that size that pulled off. One of the things I like about fishing with you is that you never give up, even after we had a very good start to the day with a 57 lb fish. 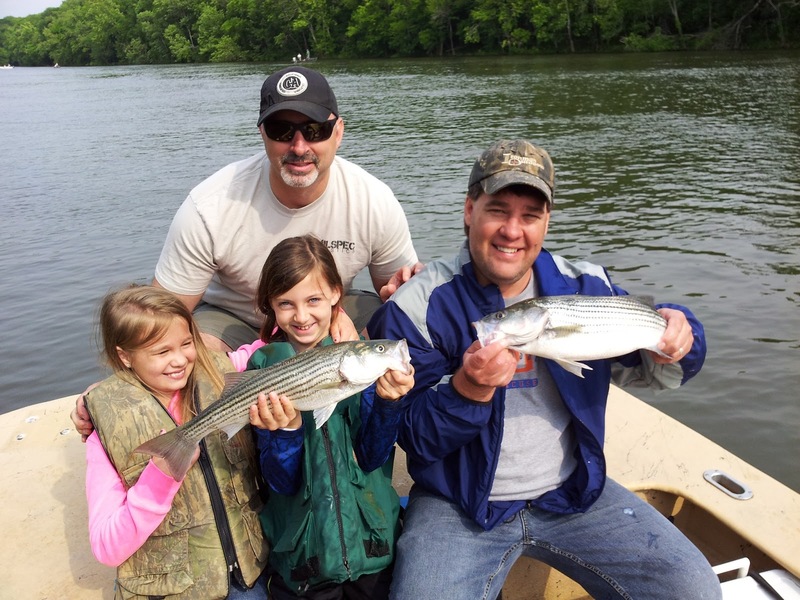 You never quit trying to catch fish for your anglers. After the cobia bite stalled and AJ's wouldn't cooperate and several cobia refused to take a jig, you made the effort to find more fish and we caught three more cobia, including a 50 pounder. Fantastic day of fishing! Looking forward to the next trip. 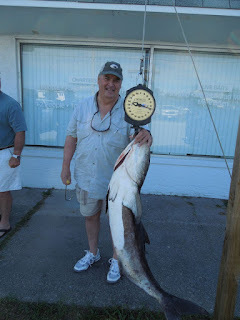 George--had great time Weds (as always); I've shared some of the catch w/four other families, so nothing will go to waste! I had some last night---mighty, mighty tasty w/a little BBQ sauce! Caught a few pups real early this AM in the creek. Best wishes to you & Anna. God bless!!!! 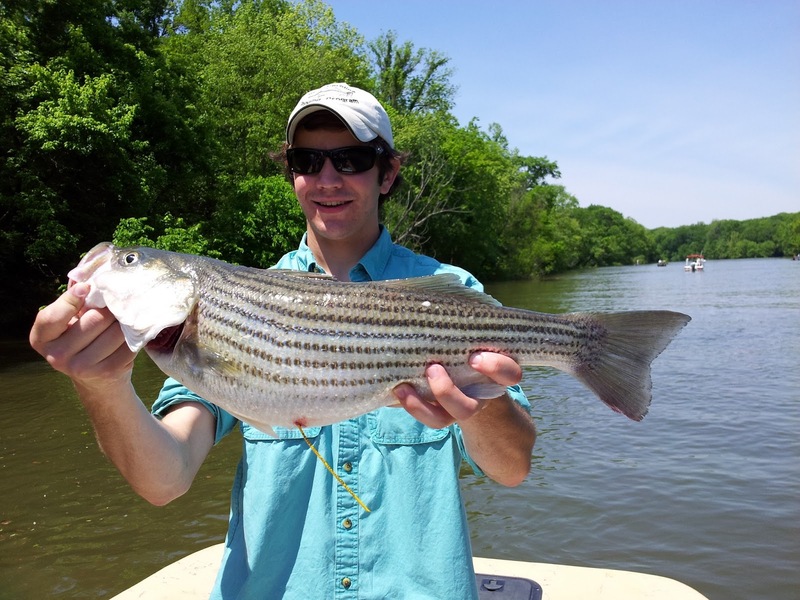 Just like last year, fishing on the Roanoke has improved dramatically in the past few days. Caught 120 or more on all of my last four half day trips. Lots of slot fish are stacked from the ramp to the curve below the rock. 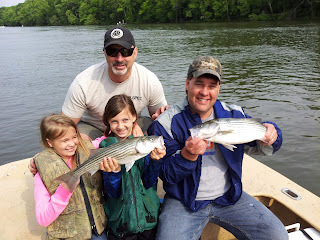 Water levels have been steady at around 13000 for over a week and water temp is still only 67, so if you're looking for a Memorial Day "catching trip"... come on down. Right now, I've got it all to myself. Fished with three other boats yesterday. Bait is still available at the Ponderosa Campground between the ramp and the I-95 bridge. "Daddy, Why does the water looks so red?" 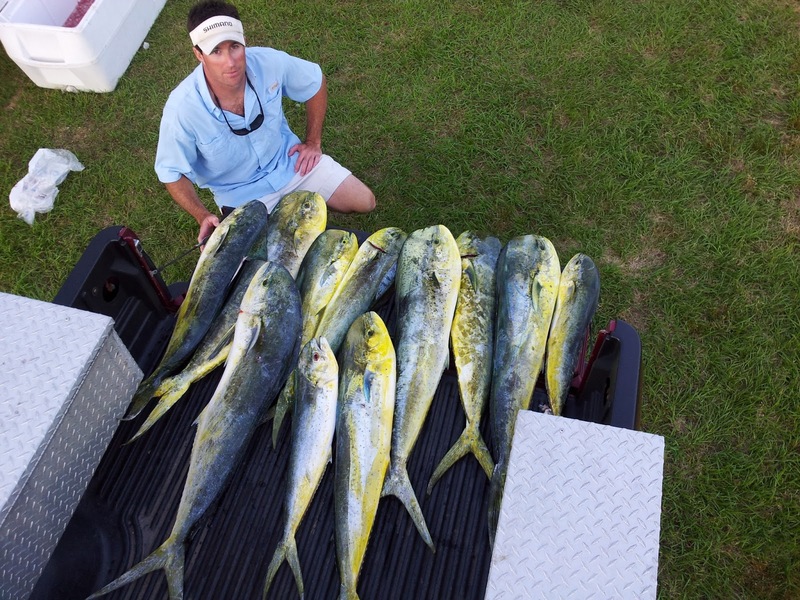 Not all of them, but congrats to Jeff for getting some of these to the gaff with the long rod. "I'm sure you heard, but we swept the dailies. I ended up catching 5 sails and a blue the last day and ended up getting top angler. Dwight got third. We ended up with 26 sails and 2 blues for 3200 points. 2nd and 3rd were tied at 2000. James and Dragin Fly crew did an amazing job, as usual. James amazes me with his nose for finding billfish. 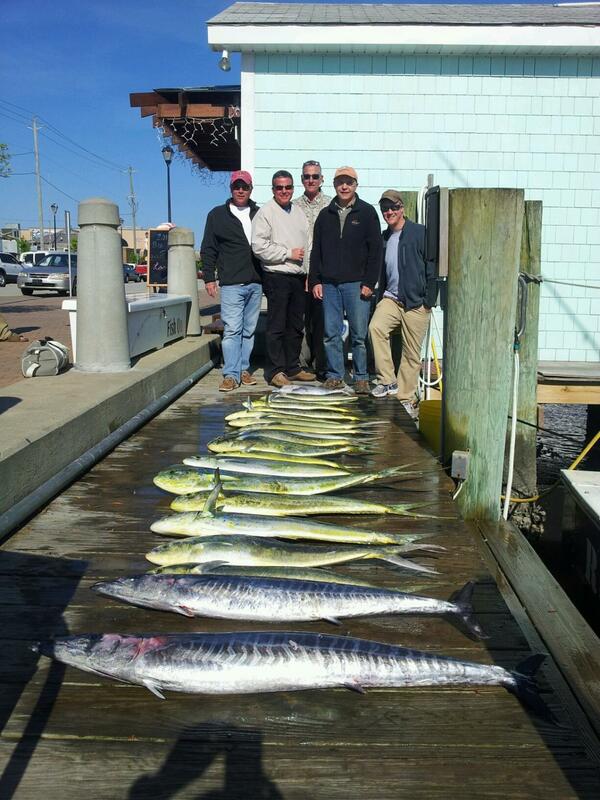 Chris Kimrey and Joe Shute started the day with the ablies and a 25 pound blackfin on AR 315. How about that? 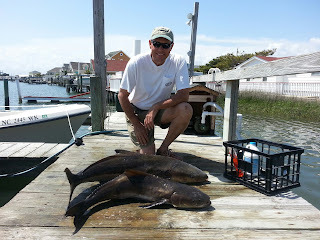 Greg was headed towards Ocracoke when I saw him last, maybe the cobia fishing is a little better up there. Thank goodness for the aj's. 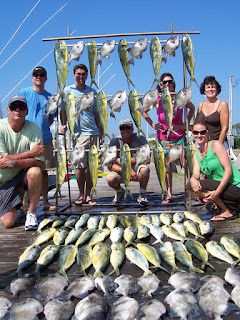 Dozen gaffers 3 hoos, limit of groupers and Beeliners, triggers, 2 kings, 1 cobia-----from Capt. 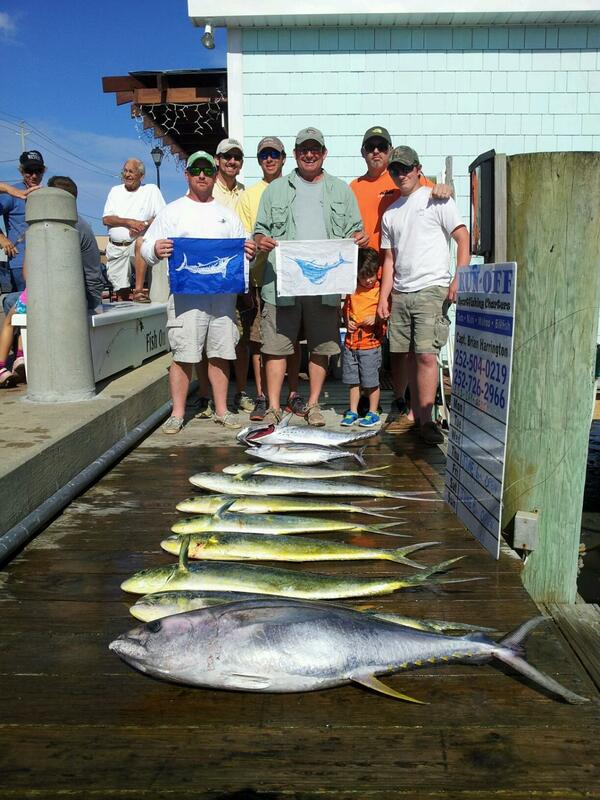 Ray's pelagic/bottom combo trip. Hey guys, just thought I’d give you an update. 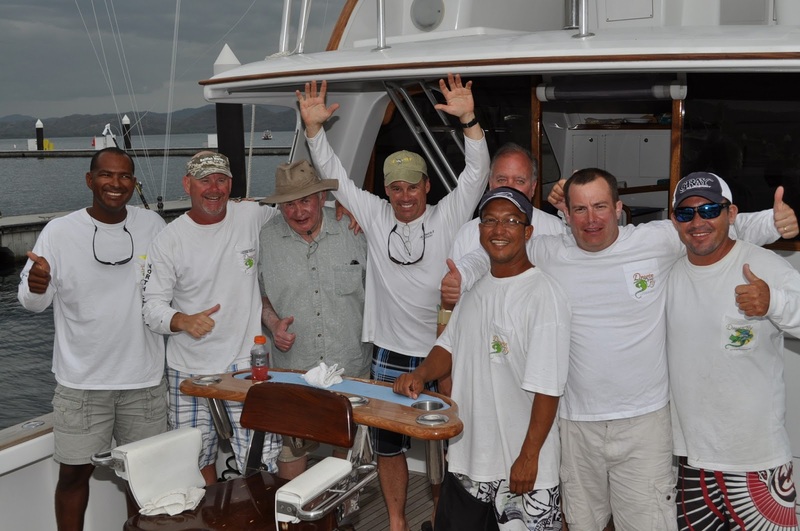 After the first day of the tourney we are in 1st place (of 8 boats) with 7 sailfish (100 points each) and 1 marlin (300 points). So we have a thousand points. 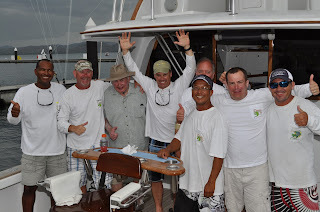 Dwight, another one of our anglers, caught the (~350# black) marlin (and 3 sails). 2nd place boat has 500 I believe, so we are looking good, but still have 2 days of fishing. I caught 2 sails today. Gus got to catch 2 sails yesterday in practice. Anyway, we’re having a good time, weather’s been pretty nice, a bit hot, but that’s expected. Hope all is well on the home front. 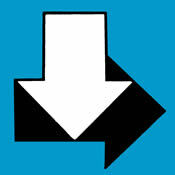 I’ll try and update you tomorrow. 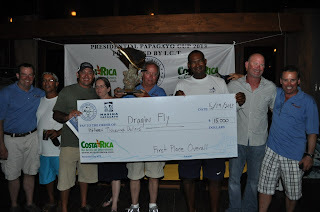 Take care & GO TEAM DRAGIN FLY! .....and from the Crystal Coast....congrats to Capt. 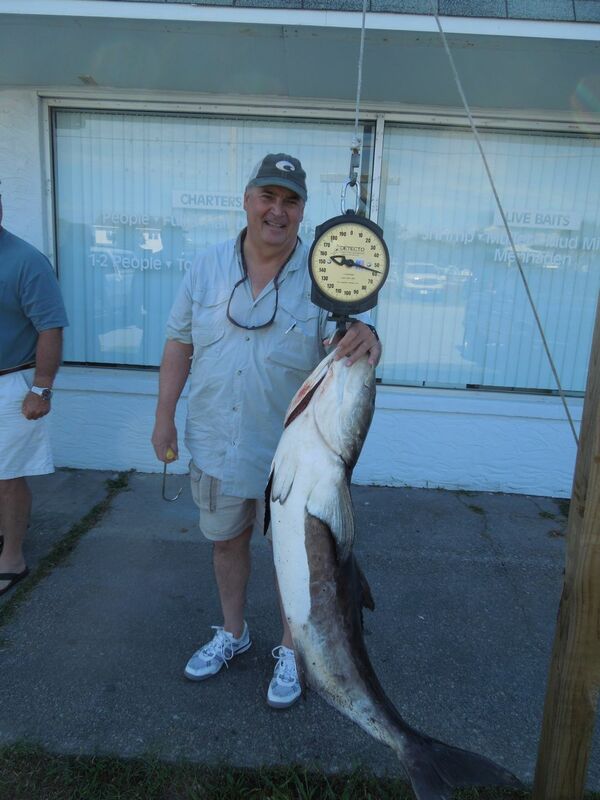 Chris Kimrey and his 50+ pound cobia, sounds like some were caught up the beach as well......still waiting my turn. The last one I saw took about 300 miles, so I'm about due to see another one......all the difference a day can make. So with 3 days of solid fishing up on the Roanoke (while I'm on the coast), I charge up there to get in on the best action of the year......just in time to watch the water drop about 2 feet......and the fish do what they do when the water suddenly starts to disappear of the top of their heads......they shut down and quit biting. Those 100 fish half days are still there, but they waited to resume until I started heading back to the coast and this SW blow of 25 and gusts to 30. According to Capt. Rod, of course, they were biting again. With water levels forecast to hold at 13,000 and temps where they need to be, there will be some good fishing up there with the best of it being on the fly and topwater. Great place to learn how to throw a jig. Meanwhile, at the beach, I got out there today for a few hours before the gale started. I actually saw a cobia, nice 'un, about 30 pounds, unfortunately, the sea conditions were very snotty, I made a poor cast, got tangled up in my own mess and couldn't find the fish again. 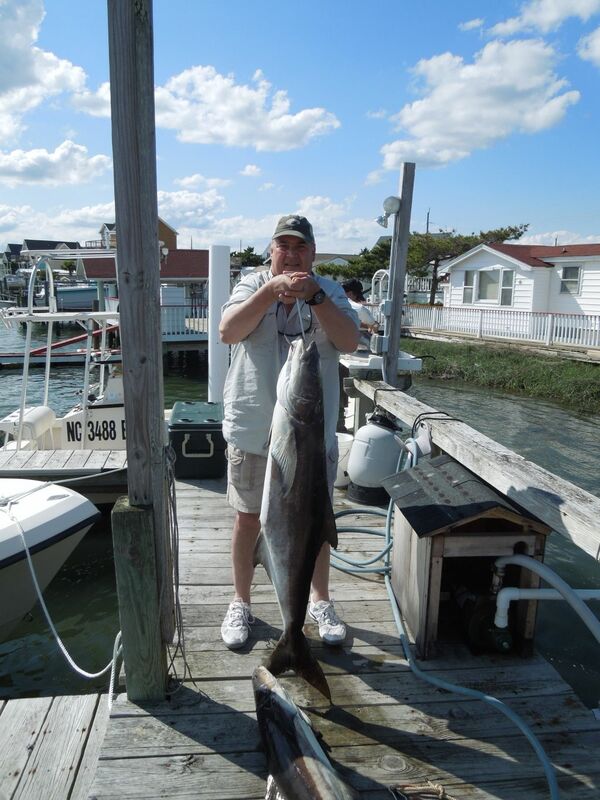 Never saw it again, but as I beat my customers back to the inlet, I did run accross PLENTY of bait. We are on the cusp of something big. Big stuff happening offshore, good dolphin bite, scattered wahoos and blackfins, an occasional yellowfin and the marlins are making an appearance. The Run Off took a lay day today and Brian sent me some recent pics. For me, it's been some pretty good false albacore fishing, but in 250 miles of traveling, I have not seen much more than albies, a few spanish and blues up on the surface. No brown bombers. On those wrecks and reefs a gathering has come together and they will soon be coming ashore......if the water temps will ever warm up. Record lows forecast for Monday/Tuesday, in the low 40's. Fortunately back in the 80's by mid-week, maybe that'll do it. Check out this 60 pounder that will not be making it to the party this year. Congrats Tom Cat, that's a nice 'un. I may have to slip up there and check it out. All that high water on the Roanoke didn't hurt things a bit, in fact, today was one of the best days of the season. Capt. 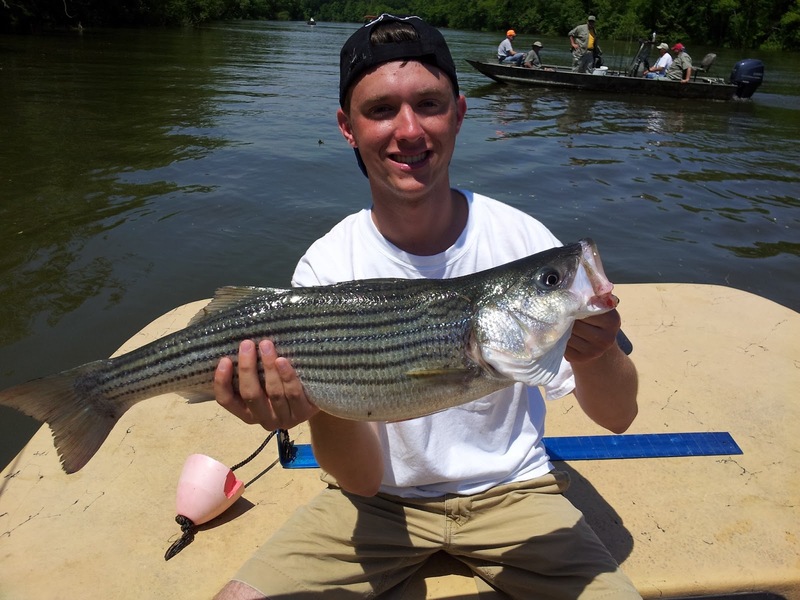 Joe Ward had well over 100 stripers on artificials. Good times. 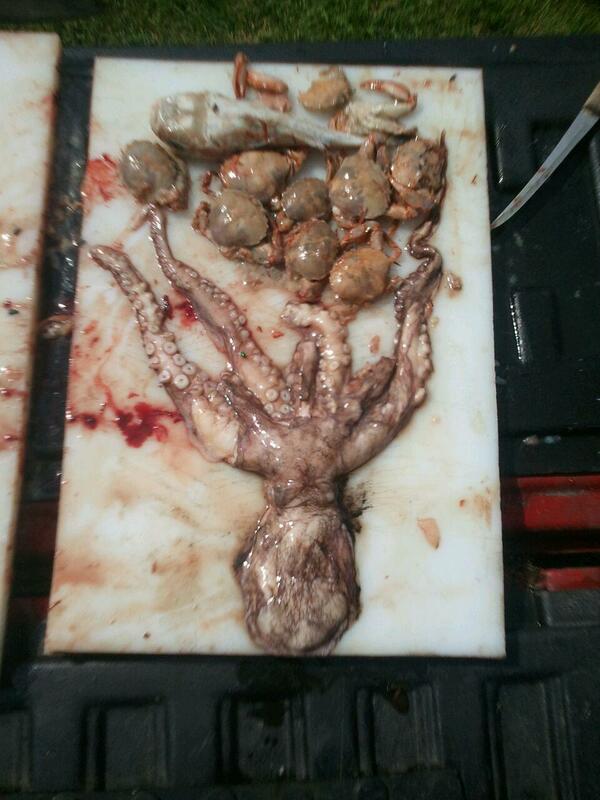 On the coast, the water temps this afternoon were finally where they needed to be and we found the bait. As usually happens, the cobia usually fire off with a bang, with the best fishing of the year often coming in on the first wave......we're still waiting. No cobes, but the albie fishing was as good as it gets. 8-10 pounders on a 7 wt and spinning tackle. Very cool. No, I'm not talking about any of my ex's, I'm talking about the water on the East Side. Cold and Dirty. It's going to be a bloodbath on June 1 when the season on sea bass opens. We were hoping to bring some cobes up off the bottom. Fished about 10 spots and sea bass everywhere, also about a 8 foot sand tiger, lots of bluefish, a great trout, two species of pinfish and a couple species that a marine biologist ought to recognize.....some kind of grunts...... The highlight of the day was a pair of bonafide American Red Snapper, in the 12-15 pound range. After a 12 hour day and 120 miles, I'll be looking some different water tomorrow. ...... "Now, it's like it's supposed to be, 5 feet thick off the bottom for a mile and a half"
If you know what that means, it's good. If you don't, then call us to find out. Plenty of openings for the best of the Roanoke. Looks like its going to be a long season and I might fish some of my late May trips up there. I have a feeling that once this weather breaks and the water temp starts to come up, we are going to see some awesome fishing. 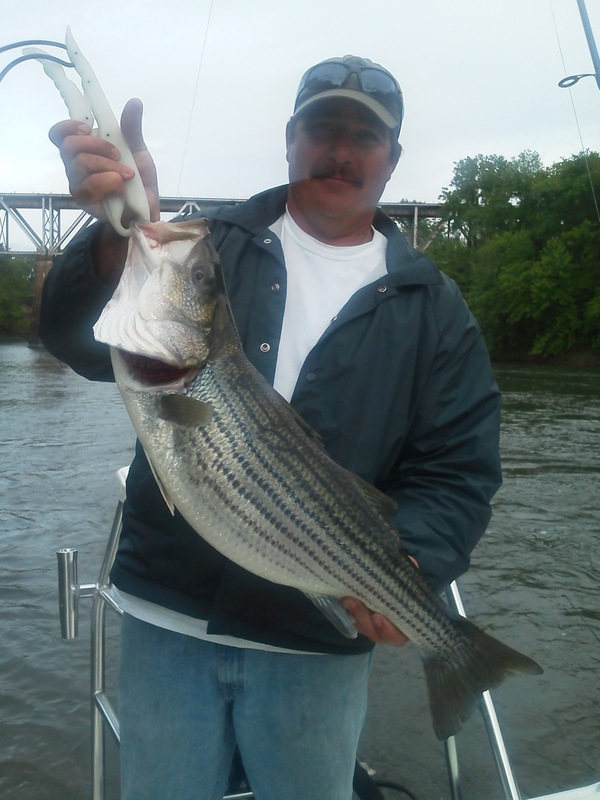 We have Richard's schedule along with some other great Down East Guides who will be extending their season on the Roanoke to take advantage of the EPIC fishing on the horizon. Looks like the weather is better down there than it is up here. Wouldn't mind spending some time on that panga. Really good morning fly bite, a little tougher in the afternoon, but it was still the first trip that we made the day without the need for bait. So what's up with this crazy spring weather? The fish get up here, it looks decent, then BAM!!! someone pushes the RESET button and we have to wait on them all over again. Really? Rain all day and highs barely making it above 60? One or two days of this crap between several days of sunshine and 80 degrees is more the norm, but where is the sun? "I'm sorry for the tough fishing, but where can you go and apologize for catching this many fish in a half day?" Greg did have a big day with the little guys yesterday, catching well over 100. Good afternoon jig bite yesterday, even with the RESET button, it is getting better.